Last week I was visiting my parents and my Mom asked me to carry a few things from the garage to the basement. One of the items was a shadow box loaded with keepsakes that had belonged to my grandmother and my aunt. 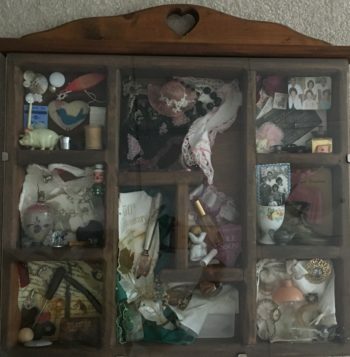 I had seen this box before and remembered there were other shadow boxes that my mother and other family members had put together decades ago. Some of the contents of this particular box had come loose during my parents move to a new home, so we opened it up to glue them back down. I started asking Mom about various items in the box and there were a few of which she couldn’t remember the significance. I’m sure when she put these shadow boxes together, she figured she would always remember the story of each token. Although we can appreciate that the forgotten objects were special to a loved one, we will unfortunately probably never know the stories behind them. The good news is that I am getting the opportunity to go through the objects in this shadow box of memories WITH my mom and hear all the stories that she does remember. The lesson in this is to include an index or a map with any of the keepsakes that you want to pass on to a loved one. For my Mom’s box, I’m thinking I will draw a sketch of the compartments and put numbers where each item is located. Then I will have a list of the numbered items and a description of each. I’ll laminate the list when we are finished and use Velcro sticky dots to adhere it to the back. Have you done any projects that involved keepsakes? Did you do anything to ensure that the meaning wouldn’t be lost when the people who held the memories are gone? Tell us about it in the “Let us know what you think!” section below.